Since 2014 Roosevelt has been playing daily fantasy sports. He is a part of the less than 1% of the fantasy sports community who has ever placed 1st in a large field tournament with over 20,000 entries. On this blog he shares insights on the plays that he likes for a wide variety of different sports! A Sports 4 Profit blog. UFC Fight Night was this past Saturday. Shevchenko successfully defended her title. Week 4 is in the books. Last week I finished with a very tiny loss. Let's see how I did this week! Tuesday January 24th to Monday January 30th. Now that football season is over, the vast majority of my contests are going to be in the NBA. This week was no exception. However, UFC had a Fight Night event, so I had a decent amount of contents that I played in fantasy MMA as well. I also played two NHL contests and 2 PGA contests. The NHL contests were free entries that I won. The PGA contest was a special offer that DraftKings made me. They gave me the opportunity to play in a contest with a $3 entry fee. If I lost, they would return my $3 back. I would play fantasy figure skating if you guaranteed me that I would win money or give me my entry fee back so that was a no brainer! On Tuesday, I started off with a winning night. Wednesday I had a pretty decent night that put me even further in the profit column. Thursday and Friday were both losing nights and I pretty much gave back all of the money I won on Wednesday. However, on Saturday I made back everything I lost on Thursday and Friday and then some! Sunday, I finished with a small win and on Monday I took a loss. All in all I finished in the profit column, my first winning week in 2017! This week I want to talk about how to build successful lineups playing fantasy MMA. 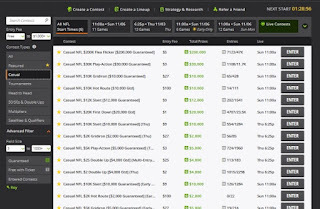 There is a lot of information out there on how to build lineups for the major sports. However, there isn't a whole lot of information out there on how to build lineups for the sports that aren't as popular. Since MMA is the only smaller sport that I play, I thought I would share with you my routine for how I go about building fantasy MMA lineups. While I enjoy watching MMA I am by no means an expert on the sport. Even if I was, there are still people out there who know a lot more about the sport than I do. So I have a simple strategy that I utilize to figure out which fighters to pick. The first step I take is I identify the fighters on the card and what their prices are for that particular event. Prices are one of the most important elements to playing fantasy MMA. A fighter could be the greatest fighter that ever existed with the easiest opponent of all time. However, if the price does not allow me to build a team of fighters that can compete and win, I will not be able to select that fighter. Once I know the prices, that gives me an idea of what type of score I'm going to need from that fighter to hit my goal for that particular lineup. There are two types of lineups that I build. I build one cash lineup and several GPP lineups. My cash lineup, my overall goal is safety. I want that lineup to be just good enough to win. My cash lineup is the lineup that I am going to enter into head to head contests, 50/50 contests, double up contests, triple up contests and 3 man contests. So I'm looking to build a team that is safe and has a great shot at scoring a minimum number of points. My experience tells me that generally speaking, I'm going to need my team to score 375 points in order to win most of my cash contests. So on average, I need to get a score of 62.5 from each fighter. With my GPP lineups, my overall goal is to win and take home a top cash prize. I want my lineup to be the top lineup of the night. My experience tells me that generally speaking, I'm going to need my team to score 600 points in order to have a realistic shot at winning a top prize in a guaranteed prize pool tournament. So I'm looking for fighters who can score 100 points. For example, Valentina Shevchenko was priced at $8,400 this weekend. So how do I know how many points I need from her? 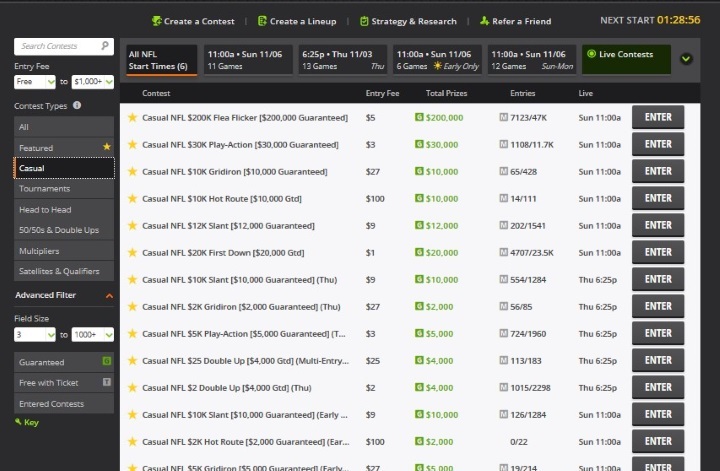 DraftKings gives us a total team salary of $50,000. The amount of points that I'm going to need from her is going to depend on what type of contest I am entering. If I am entering a cash contest using Shevchenko, I need 375 points for my team. $8,400 represents 16.8% of my total team budget. That means I need Shevchenko to score at least 16.8% of my goal of 375 points to justify her salary. That means I need her to score at least 63 fantasy points. If I am entering a GPP contest using Shevchenko because my goal is to score 600 points, at a salary of $8,400, I need her to score 16.8% of my 600 points. That means I need her to score at least 100 points. If I don't feel confident that she can score 100 points, the only way I can take her in a GPP is if I feel like another fighter can score more than the minimum to make up what she doesn't score. After prices, the next thing I look at are the betting odds. Casinos have built a substantial income on their ability to accurately reflect how they see the fight playing out and handicapping it so that they get enough betting action on both sides. They know a LOT more about mixed martial arts than I do, so I trust what they put out to accurately reflect what is most likely to happen. One of my favorite sites to check out the betting odds is Best Fight Odds. They show odds from a wide variety of different betting sites and casinos. There are three key odds that I look at for every fight. The first odds that I look at is the fighter's odds to win the fight. I go based on the American odds system. In the American odds system an even fight has an odd score of 100. That means if you bet $100 in a casino and you win, you win $100 in profit. A fighter that is a favorite will have an odd score with a negative. For instance, if a fighter has an odd score of -150, that means you will need to bet $150 in a casino on that fighter, just to make the same $100 in profit. If the fighter is an underdog, that fighter will have a plus odd score. For instance, if a fighter has an odd score of +150 that means that you would win $150 in profit for a $100 bet. So what I do is I look at the odd scores. The more heavily favorite the fighter is, the more likely that fighter is going to win the fight. When you compare the odds to win with the salary on DraftKings, sometimes values can be discovered. A fighter could have the 4th highest odds to win, but only the 7th highest salary on DraftKings. That means that fighter has a good price value compared to his/her odds to win and that's a fighter that I'm likely to target more in my lineups. The second odds that I look at is the over/under odds for what round the fight goes to. On DraftKings, a fighter receives 90 points for a first round finish. For a decision win, a fighter receives only 30 points. This is very important because it can help you decide which fighters to target and what fighters to avoid. For example, a lot of players liked Donald Cerrone at $8,900. However, if you looked at BOTH the odds to win and the over/under odds, you will see that he wasn't one of the better fighters to target on this card. His odds to win closed at -175 which is very good. However, his over/under odds closed at -185 to go longer than 2 1/2 rounds. That means that according to the betting, the most likely win outcome for Cerrone was a win by decision. A decision win only gets you 30 points. That means he would really need to dominate this fight and score enough points in the other categories to make up for it. Meanwhile Francis Ngannou was $9,600 which was $700 more. However, if you look at BOTH the odds to win and the over/under odds, you will see that he was worth the higher price. His odds to win closed at -420 which is INSANE! You would have to bet $420 just to win $100, that's how confident people were that he was going to win this fight. His over/under odds closed at -225 to go shorter than 1 1/2 rounds. That means that the people betting were very confident that he was going to win and that he was going to finish this fight fast. A first round finish gives a fighter 90 points. What this means is that Ngannou's most likely scenario guaranteed you 90 points, and in actuality, it guaranteed you 100 points because he was going to win by knockout and you get 10 points for a knockdown. Cerrone's most likely finish was 30 points. Therefore Ngannou was the MUCH better play on this card. The third area that I'm looking at is inside the distance odds. Inside the distance odds is a bet on whether the fighter will finish the fight. So if the fighter wins by knockout, submission, technical knockout, doctor stoppage or the corner throwing in the towel, that is considered an inside the distance win. This is important for fantasy purposes because the scoring dictates that a fighter gets more points for a finish win than he/she gets for a decision win. Going back to the Cerrone vs Ngannou comparison, Cerrone closed with a +350 inside the distance odds. That means that it was very unlikely that he was going to finish this fight. Meanwhile, Ngannou closed at a -275 inside the distance odds. That means that it was very likely that he was going to finish this fight. By the way, in case you didn't see the card and you are wondering what happened, Ngannou got a first round knockout victory. Cerrone got knocked out in the 2nd round! There are two other resources that I look at as well after looking at the Vegas odds. The first resource is UFC.com. They have a wealth of information available on the fighters. They have a profile on each fighter where you can look at their record, their striking and grappling statistics as well as a full history of their fights. They also have a fantasy UFC section where you can pick for each card who you think will win and how you expect them to win. The fantasy section is also helpful because it shows you who other UFC fans are picking. That is beneficial for fantasy purposes because it can give you an idea as to which fighters are going to be more higher owned. The other resource that I look at is Cagerank.com. They have an algorithm where they predict who they believe will win a fight between two fighters. Each fighter is assigned a cagerank based on the ELO rating system, which has been used for sports like tennis and chess for years. It works well for MMA as well since it is an individual sport. The final thing that I will do is take a look at some of the expert fantasy MMA players and see what they have to say. I like to look at the fantasy MMA section at rotogrinders. I also like to watch the Daily Fantasy MMA channel on YouTube. Did You Know There Are Currently 9 Things You Can Do Right Now To Make Money As A Sports Fan? To Learn More Sign Up For Our Free Online E-mail Course With 10 Days Of Free Content! Sports4Profit is an educational and consulting company designed to help YOU the SPORTS FAN to start to monetize your passion for sports. Sign up today by filling out the form below! Week 3 is in the books. Surely it had to be better than that disaster that was week 2 right? Let's find out! Like last week, this was also a mostly NBA week. On Tuesday, I was FINALLY able to break the losing streak in NBA. Wednesday and Thursday I took some losses. Friday, however was a decent day and I was able to make up some ground and then some! Saturday, however, was a bad night and I lost most of that ground I made up. Sunday and Monday I finished with some small losses to close the week with a very tiny loss. 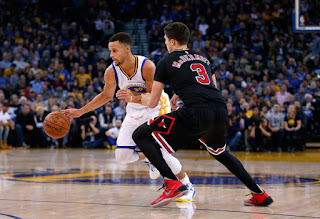 This week, I want to talk about the importance of analyzing defense vs position when drafting fantasy basketball players for your team. It is not enough just to pick the best players based on their price. You want to also look at how the team they are playing against matches up. Let's say you are building a fantasy basketball team tonight. You are looking for a player at the Power Forward position. You see that the Denver Nuggets are playing the Utah Jazz tonight. The game has an over/under of 211.5. That means Vegas expects both teams to have a combined score of that amount. That is actually a very good over/under. You take a look at the Nuggets and see that Kenneth Faried is starting tonight at the Power Forward position. In his last game he had a salary of $5600 on DraftKings. Tonight, he has a salary of only $4800 on DraftKings. Reduced salary for a player who has scored as much of 48.25 fantasy points in one game. That seems like a good play in theory right? 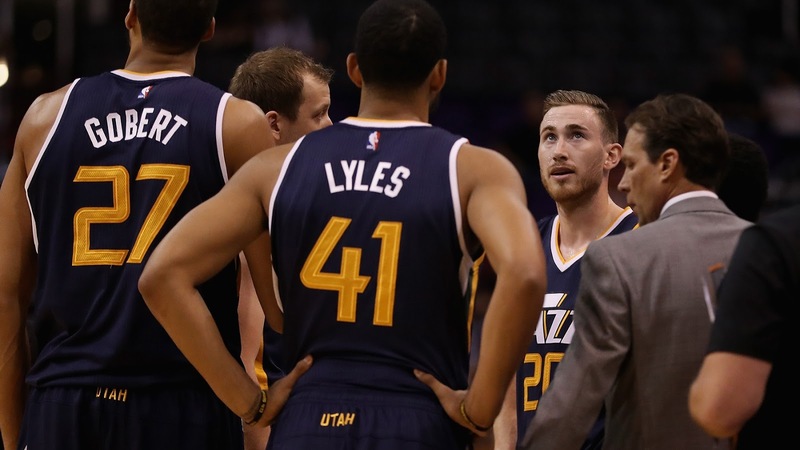 However, if you take a look at defense vs position rankings, you will see that the Utah Jazz has a DVP rating of #1. This means that Power Forwards average the LEAST amount of fantasy points against them than against ANY other team in the NBA. This is a bad matchup for Kenneth Faried even with the reduced salary. He is not someone that you will want to play tonight because he is in a bad defensive matchup. Does that mean you shouldn't play him at all? Not necessarily. Defense vs Position is only one of the many factors that you want to look at. However you definitely want to look at it and in this case, this is a negative factor to playing Faried tonight. On the flip side, George Hill from the Utah Jazz is the point guard. If you look at Denver's Defensse vs Position, the Nuggets have a DVP rating of #29. This means that out of 30 NBA teams, only ONE team allows more fantasy points on average to point guards than the Nuggets. This is actually a good matchup for George Hill tonight. Make sure that you consider defense vs position when factoring in who you want to play. There are a number of websites where you can find defense vs position statistics. Here is one that shows it for both FanDuel and DraftKings. Week 2 has come and gone in 2017. Let's see how I did in the 2nd week of the new year! Tuesday January 10th to Monday January 16th. With the conclusion of the football season this week was almost exclusively a NBA week. This week was one of my worst weeks this season in NBA. I lost Tuesday. I lost Wednesday. I lost Thursday. I lost Friday! Combine that with the 4 day losing streak from the previous week and that put me at an 8 day losing streak! This is why it is SO IMPORTANT that you practice good bankroll management skills. The reason why I can handle a losing streak for that many nights consecutively is because I protect my bankroll by only playing a portion of it every night. So when I lose money I am playing LESS money and when I win money I am playing MORE money. Saturday I took off and didn't play at all. I took my daughter to American Girl for her birthday and brought her a brand new American Girl doll! She was ecstatic! For at least one day this week, I was a winner! Sunday night was UFC Fight Night Phoenix. I only played Tournaments that night because I was really busy this weekend. However, I had a great night and was able to cut into some of these losses a little bit. Sunday was also round 2 of my football contest. I finished 30,365 out of 142,171. I have one final chance next week to Crack the top. Monday was back to NBA and back to more losing! Definitely one of the WORST NBA weeks that I can recall ever having. It happens! Fortunately there are still 50 more weeks left to go in the year! In today's article I want to explain the difference between two types of players that you will be drafting on your fantasy teams. This concept is relevant in every sport and it is a foundational concept that you want to understand if you want to become a good fantasy sports player. The concept is high floor vs high ceiling players. The types of players that you want to draft for your fantasy team depends on the type of contest you are competing in. The higher your chances are at finishing in a cash position the more safety and security you want in your players. The lower your chances are at finishing in a cash position the more chances you will need to take in your selection. The safest players in fantasy sports are known as high floor players. So what exactly is a high floor player? All fantasy players accumulate fantasy points for each contest they are a part of. If you look at their historical performance from their previous contests you will see how many fantasy points they scored. A fantasy player that you can count on a certain minimum amount of fantasy points even on a bad day is what is known as a high floor player. Stephen Curry is an example of a high floor player. Over his last ten games, the lowest amount of fantasy points that he has scored on DraftKings is 28.75 points. The risker players in fantasy sports are known as high ceiling players. So what exactly is a high ceiling player? One thing to keep in mind is that this is all relative to the value of the player. The value of the player is based on what the typical salary is for that player on a fantasy sports website. For example Doug McDermott's last salary was $3,900 on DraftKings. 7.5 is a very low floor because at a salary of $3,900 that means he only scored 2 times his price value. You typically need on average 5 times a player's price in fantasy NBA to have a profitable night in cash contests. Stephen Curry's last salary was $9,000 on DraftKings. At that salary, his 28.75 is good for at least 3 times his price value. That gives him a higher floor than Doug McDermott. Why is this important? It is important because you to know how to distinguish between high floor players and high ceiling players when you make your fantasy lineups. Certain types of contest dictates that you want to have a lot of high floor players. Other types of contests dictate that you want to take a chance on more high ceiling players. For example, in any contest where you have a 50% chance of winning (i.e. 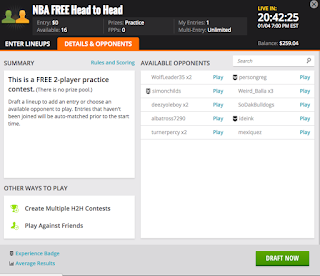 head to head and 50/50 contests) you want to have a lot of high floor players. Your objective isn't to have the highest scoring team of the night. Your objective is to have a team that will outscore half the other teams competing that night. As a result, you want to pick players who are likely to score a certain number of points. In a contest where you need to be in the top 20% to win, you want to take more chances on high ceiling players. Those players could bomb and sink your lineup. However, if those players have a big night, they could be the difference between you winning that night and you losing. You also want to look at how many times they hit their lowest amount of points scored. A player who only has 1 game out of 10 that low is a much lower risk than a player who had 4 games out of 10 that low. For high floor players, look for players like Russell Westbrook, James Harden, DeMarcus Cousins, Kevin Durant, LeBron James, John Wall and Giannis Antetokounmpo. If you are looking at high floor mid salary players, look for players like Avery Bradley, Dwight Howard, Harrison Barnes, Kristaps Porzingis and Myles Turner. For high ceiling players, look for players like Jimmy Butler, Karl-Anthony Towns, Isaiah Thomas, Eric Bledsoe and Nikola Jokic. Some lower priced high ceiling players include Tim Frazier, Rajon Rondo, Taj Gibson, Ryan Anderson and J.J. Barea. Finally, keep in mind projected minutes also play a role in determining whether a player has a high floor or a high ceiling. If a player is only projected to get 20 minutes that night, that player is not a high floor player. 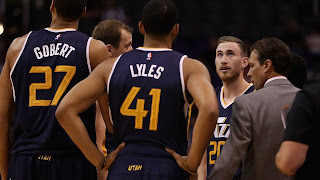 However, if a player is projected to get 30 or more minutes and is replacing a player in the starting lineup, that player is more likely to be considered a high floor player. Especially if that player has a history and a track record of scoring a higher than average number of points when having the opportunity to play more minutes. Week 1 of 2017 is in the books! This is my first full week of playing exclusively fantasy basketball. Now that the NFL regular season is over, I'm done with football. Some people like playing the playoff slates, but that's not really my cup of tea personally. I would rather turn my full attention to playing basketball. Because I will be doing this for the entire year and during football season the slate goes from Thursday to Monday, I'm going to track the weekly results from Tuesday to the following Monday. So here we go. The vast majority of my games were in the NBA this week. I played 2 games of PGA due to the fact that I won a free entry into a PGA tournament. I know nothing about PGA, so I just did some research and see who the top PGA players were recommending. Then I picked those players. The prize was DraftKing dollars, or if you were in the top 3, you won your very own customized VIP local sports experience. So for instance, as a Knick fan, I could get front row seats to a Knicks game and potentially go to the back and meet the players. I played one game of NFL because I won an entry into a free NFL game due to winning my Yahoo Season Long fantasy sports championship. I finished in the top 43% for PGA, you needed to be in the top 2% in this particular contest. As for football, it's a 3 round contest and I'm currently in the top 27% I need to be even higher than the top 1% to win this. As for NBA, I finished the week with a small loss, at -5.1% ROI. I started the week off with 3 straight profitable nights. However, I finished the week with 4 straight losing nights, which resulted in a loss. I am also at a loss for the month because at the beginning of the month I entered a big New Years tournament and maxed entered a small arcade tournament and had a really bad night. So we are down for the week and the month. Fortunately we still have 51 more weeks left to go! Average winning player averages about 5% ROI lifetime so I'm still almost double the average lifetime. This week, I want to talk about a topic that's not often talked about but is something that is very important. Particularly if your goal is to earn a long term profit in fantasy sports. That topic is game and opponent selection. If you want to maximize your profits, it is important that you select the games and opponents that give you the best opportunity to maximize your profit. Selecting the right game and the right opponent gives you the opportunity to do that. Let's start with beginners. Those of you who are brand new to the industry. 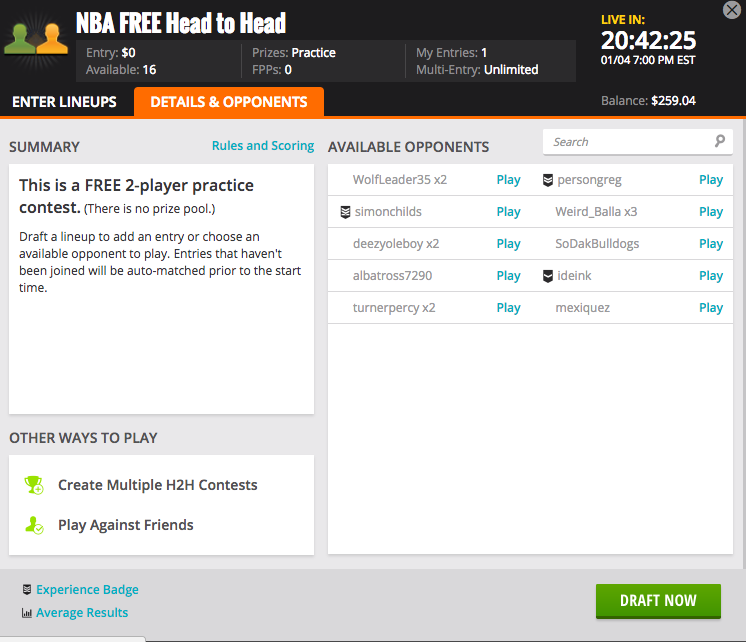 DraftKings (and most fantasy websites) have a slate of games that they allow you to participate in as a brand new player called "Beginner Games." To be considered a beginner, you have played less than 50 games in that particular sport. You should see a special tab labeled "Beginner" when you log into the website. If you are a beginning I HIGHLY RECOMMEND that you TAKE ADVANTAGE OF THESE GAMES! Why play against the best of the best when you can limit yourself only to other newcomers who are just like you? If you are a beginner, one way you can maximize your chances at profit is by making sure that your first 50 games are exclusively beginner games. As an experienced player, if I see a beginner in the main game lobby, I will scoop up in there and I will take ALL of their games. You want to swim in the ocean with the sharks? Prepared to get eaten alive! Don't let this be you! Stick to the beginner games for your first 50 games. What happens after you complete 50 games? You STILL don't have to play against the big boys yet. That's because DraftKings has ANOTHER group of games designed just for you as well. They are called Casual games. Like beginner games, you get a separate tab of games for these casual contests. You are eligible to play in these games as long as you have less than 500 games played. If you have played less than 500 games, I recommend that you stick to the casual games. I will scope out casual players as well in the main games and if I find one, I will pick up those games and beat you. 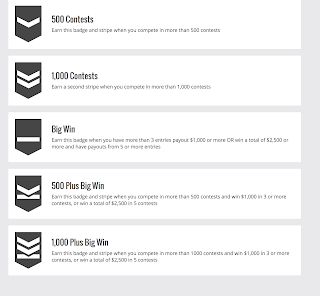 Once you reach 500 contests, you are no longer a casual player. At this point, now you have to enter the main slate of games and play against everyone else. However, even in the main lobby of games there are things that you can do to maximize your opportunities to profit. My first recommendation deals with Head to Head games. NEVER create your own HEAD TO HEAD games! When you create your own head to head games, you have no control over who your opponent will be. Highly experienced players like myself can simply look in the lobby, scope you out and take your games. However, if you instead CHOOSE your own games, you now have full control over who you play. How do you decide which opponents to play? By looking at the players experience badge! Once you have reached 500 contest played, you are awarded the "500 Contest" experience badge. This is the first badge that you are eligible to earn. Earning this badge also makes you no longer eligible for casual game contests. The next level is 1000 contests played. You earn this one once you have 1000 or more contests played. The third level is the Big Win level. 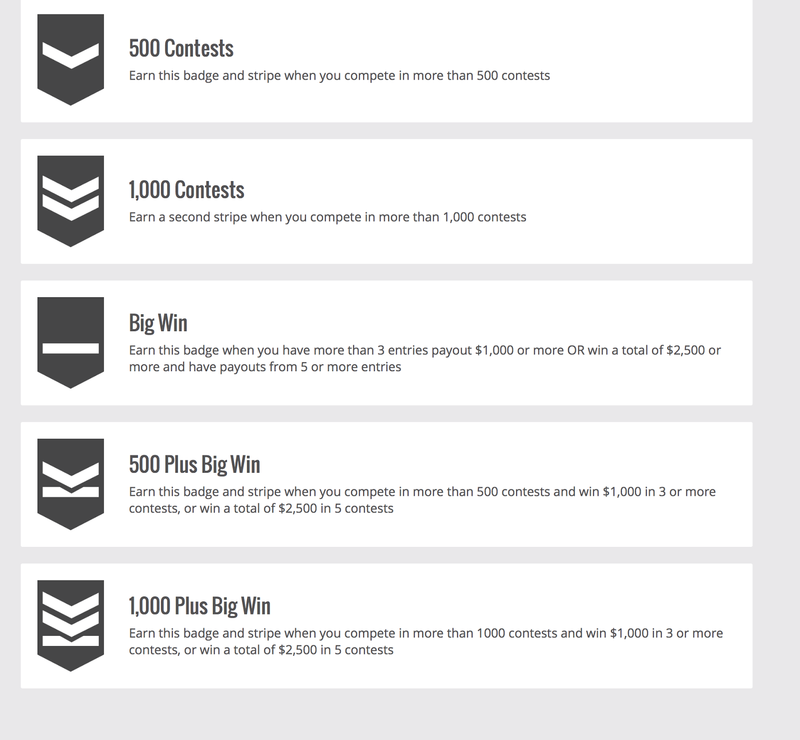 You earn this badge when you achieve a total payout of $1000 or more from 3 contest entries OR a total payout of $2,500 or more from 5 or more contest entries. The fourth level is 500 Plus Big win, which combines the 500 contest and the big win. The fifth and final level is 1,000 Plus Big win, which combines the 1000 contest and the big win. What MOST players do is they look for the dollar amount that they want to enter. They hit the ENTER button. They create their lineup and they submit. DO NOT DO THIS!!!! YOU ARE THROWING MONEY AWAY!!!! When you do this, you are creating your own contest, which either gets automatically matched up with someone else OR can be picked up by somebody else. This is not what you want to do. Instead, you see the column that says "Available Contests?" At this screen here, you can just locate the opponent that you want to play and click on the "Play" link next to their name. When you use the DraftKings app, it's much easier. When you select your game on the app and create your lineup it gives you the option to choose whether you want to submit your lineup or whether you want to choose an opponent. By selecting the "Choose An Opponent" option, it brings you to a screen similar to the one above where you can pick who you want to play. So how do you decide who to play? If you notice "Buge357" and "big-al72" have no experience badge. That means they are either beginner players or casual players. If you followed my instructions above, you should be at a bare minimum, be at a casual level. The no experience badge players are at a lower level than you so you can challenge them. Many times you won't have anyone who has no experience badge. In that case, look at the badge levels I posted above and choose the player that has the lowest badge. Sometimes, you will come across a scenario where EVERYONE has the highest experience badge. What do you do then? Do a search for contests in higher dollar amounts from the contest you are playing. Some of the players will be in those contests. Others will not. The ones that are not are likely the less experienced of the experienced and are the players you want to focus on. By focusing on the least experienced players this will maximize your ability to win. No need to play the best players if you don't have to. It's A Brand New Year! 2017: The Year Of The Fantasy Sports Professional! It's 2017. A brand new year! While 2016 was a good year for me in general, it was NOT a good year for me in fantasy sports. I finished the year off with an ROI of -17.62%. Daily fantasy sports was ruled illegal by the attorney general of the state of New York. The fantasy sports sites fought the ruling but in March of 2016, they decided that the best course of action would be to settle. They settled with the attorney general and as part of that settlement, they agreed not to operate in New York state until September, pending legislation from the New York legislation bodies explicitly allowing them to do so. The end result was I was not allowed to play in New York. In order for me to play, I would have to travel to a neighboring state where the games were allowed, in my case New Jersey and Connecticut. Since my schedule didn't allow me to do this consistently, I wasn't able to play consistently and as a result, I took a beating during the down months. Thus teaching me one valuable lesson. Playing the games consistently helps you to more easily identify the best players and thus makes you a much better player overall. Fortunately, the New York Legislature ruled that fantasy sports was legal and with some modifications, allowed the websites to reopen after Governor Andrew Cuomo signed off on the bill in August. However, I lost out on five months of playing consistently. With that said, don't cry for me Argentina. My ROI from 2015, my first full year playing was 63.55%. Due to my powerful bankroll management strategy, I can sustain YEARS of losses and still maintain my lifetime profit. And it doesn't take you winning a $50,000 grand prize to make that happen either. Winning a $1,000 tournament as a low stakes $0.25 to $1.00 player is more than enough to allow you to be able to protect your winnings using the strategy I share in the bankroll link. My long term goal is to grow my bankroll to the $100,000 mark. At this level, I will be able to play $5000 per night and at that point, all I would need is a yearly ROI of 5% of my entry fees to be able to support myself and my family doing this full time. Now I STILL wouldn't only do fantasy sports once I reach this mark. I would definitely quit my other jobs. However, there is something else that I would love to do full time as well. This was a blessing in disguise because I made this discovery during the time that fantasy sports was shut down in my state. Justin Van Zuiden is a CPA by day. He earns a living consulting people on how to minimize taxes. I would like to earn a living consulting people too. Consulting people on how to take their passion for sports and turn it into an income stream for themselves. Fantasy sports is obviously one way to do this and I have set up this blog to document my journey and share many of the important lessons that I have learned on the way. However, fantasy sports is only ONE way to do it. There are a LOT of other ways to do it as well. So I founded a company to help do just that. It's called Sports 4 Profit and this blog now falls under the umbrella of my new company. As a result, I am REALLY excited about 2017. Not only because I now get a FULL YEAR to play fantasy sports uninterrupted. Also because I now have a new company where I can help people to do what I'm doing. Take their passion for sports and turn it into a way that they can make money from. Make sure you check out our company website Sports 4 Profit to learn more about this. I'm going to commit to write at least one blog post a week. There's going to be two parts to it. The first part is where I will share with you how I did for the week. I'll let you track my ROI for the week, for the month and for the year. The second part is where I will take a topic of importance and share with you about that topic. For example, next week I'm going to talk about game and opponent selection. It is probably the second most important topic in my opinion, second only to bankroll management. A lot of players just randomly pick games, not given much thought or process to what games they are selecting, why they are selecting those games and what opponents they are selecting. When in fact, just taking a LITTLE bit of extra time and putting a little MORE thought process behind this can significantly improve your chances at earning a profit! We will talk more about this next week. Where hopefully, I will be able to report to you that my first week was profitable! Like This Article? Click The Link Below To Leave A Tip! We accept tips as low as $1, click here to leave a tip!